I spent this morning with my "little" sister, who is living at my mom's house while she waits for her PhD program to begin in the fall. We visited the Burlington Farmers' Market and had lunch with a friend at a new restaurant (teaser warning) that I'll be writing about for next week's paper. As I drove down my mom's street to drop my sister off, I noticed a small yard sale. From the (slowly) moving car, I spied a book with a pie on the front cover. So of course, I had to pay a visit. 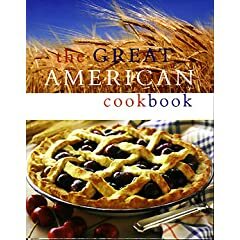 The book in question was a nice-looking 2005 hardcover called The Great American Cookbook. At $5 it seemed like a good value, so I snapped it up. Now, I already had 8 cookbooks with "America" or "USA" in the titles, but there's something different about this one...it's the only one of the bunch that was actually printed in another country -- England. Well, technically it was printed in Malaysia, but the publisher is in Britain. Yep, right on: cioppino (invented in San Fran), oysters Rockefeller, po' boys, hamburgers (did you know that sandwich buns are called "baps" in England? Weird. ), blueberry pancakes, apple pie, southern fried chicken...you get the idea. Huh? : chilled avocado and cilantro soup (sounds great, but I've never had it, nor seen it on a restaurant menu anywhere), three-bean burgers with green mayo, seafood pizza, sweet-and-sour glazed onions, broiled bell pepper relish, peach and pecan empanadas...all yummy sounding, but don't seem to define American cuisine. I envision someone in another country nodding her head and thinking, "huh, so that's what they eat over there." And it makes me more wary about jumping to conclusions when I view American-produced cookbooks about other nations!